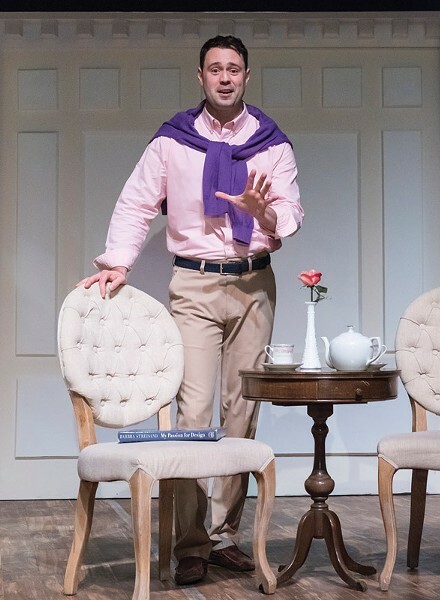 PHOTO BY LOU SCHNEIDER Jake Purcell as Alex More in "Buyer & Cellar" at JCC CenterStage. To dub Barbra Streisand a household name might be an understatement. She is one of the best-selling vocal artists in history, a stage and film actress, and one of few entertainers to be awarded multiple Emmy, Grammy, Oscar, and Tony Awards (a highly coveted status referred to in show biz as an 'EGOT'). Streisand has influenced entertainment culture since she exploded onto the scene in the mid-1960s — and now, her life is the (loose) inspiration for the current theatrical production at JCC CenterStage. In keeping with his admirable dedication to both new shows and subject matter that hat tips the Jewish community, artistic director Ralph Meranto selected Jonathan Tolins's 2013 play "Buyer & Cellar" for the current season. The show, which is an area premiere, follows struggling Los Angeles actor Alex More (played by Jake Purcell) as he lands a mysterious gig working in the basement of a Malibu mansion. The basement, he discovers, is a recreation of small main street gift shops, and the home belongs to Barbra Streisand. A zany story unfolds from there, and More becomes the audience's tour guide for Barbra's basement. In typical tour guide style, he introduces himself to the audience right away, breaking the fourth wall. Well, sort of: Purcell stays in character as More, but he does address the audience directly from in front of the stage. There are ground rules for this production, he says. First, the show is a work of fiction. "This is not journalism," More says. "There will be no excerpts on 'This American Life.'" Playwright Tolins was inspired by Streisand's 2010 book, "My Passion for Design," a largely pictorial tour of the Malibu complex she designed to resemble a New England abode, complete with a working mill, chickens, and a red barn. The book — which has a whopping four-and-a-half stars on Amazon — chronicles Barbra's personal style inspiration and features many of her own photos. "Remember, this is the part that's real," laughs More as he thumbs through the 300-page tome onstage. Secondly, he won't be doing any impressions or singing any of her songs (though Purcell's Brooklyn accent during the Streisand characterizations is impressive). Throughout the show, Purcell-as-More "portrays" many characters — housekeeper; More's boyfriend, Barry; Streisand's second husband, James Brolin — but overall, the show experience is a lot like having drinks with an old friend who's a great storyteller. As time goes on, the stories get wackier, and that's part of why hanging out is fun. Gay men either love or hate Barbra Streisand — More's boyfriend Barry loves her — but loving Barbra Streisand is tantamount to birthright if you're gay and Jewish, More jokes. He spends boring afternoons waiting for Streisand to come downstairs and "shop" in her basement. The two strike up an unlikely friendship, resulting in playful tête-à-tête. Purcell's delivery of the dialogue and characterizations is masterful and convincing, overshadowing any opening night jitters or stuttered lines. He's the only one onstage for the full 100-minute run — there's no intermission — and he commands the audience with his presence. The script could stand to have 15 or 20 minutes shaved off for the sake of climax, but that's no fault of Purcell's. He has to pull all the energy from within, because there is no one else onstage to draw from or to support him. Director David Runzo (who last directed "The Flick" at CenterStage) undoubtedly spent time working with Purcell to keep his energy levels and intonation high, as the comedic, punchy nature of the show relies heavily on those factors. A solo show is an ambitious undertaking for any theater and actor, so it's refreshing to see this happening more around town. Lighting and projected photos (presumably some from the aforementioned design bible) by Jack Witmer support the changing scenes throughout, and sound (party chatter and clips of Streisand's music) is used minimally but effectively. A minimal white and pink set by David Daniels lends an elaborate, but versatile, quality to the stage. Other than that, it's all about Purcell, clothed in "Banana Republic sale rack" pink polo shirt, khaki slacks, and violet sweater. Streisand spent her childhood in a small Brooklyn apartment with her mother, brother, and grandparents. She lived many places, but always wanted to design a house and grounds like the one featured in "My Passion for Design." While the book is a sneak peek into the lives of the rich and famous, "Buyer & Cellar" is an irreverent, farcical joy ride for those on the other side.